There was a time when the Royal York Hotel was the tallest building in Toronto. At 134 metres from the sidewalk to the tip of its Ch창teau-style roof, the grand railway hotel ruled downtown, "a mountain over city and lake," for two years before completion of Commerce Court at King and Bay. 80 years later, it's hard to spot the venerable old Royal York among the downtown office buildings. For buildings, being tall doesn't always last. If any the numerous high-rise plans announced in the last few come to fruition, the same fate awaits First Canadian Place, a tower that has been the tallest in Toronto (and Canada) for a generation. 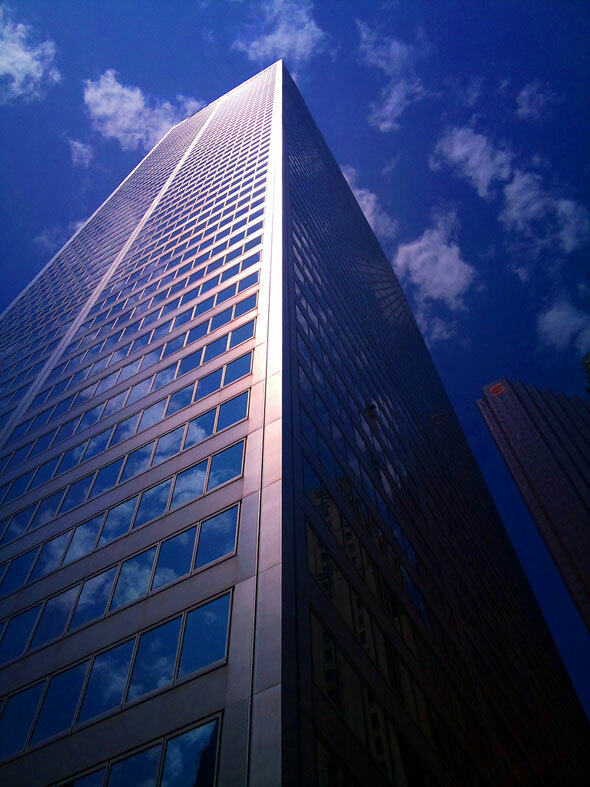 In fact, in 10 years, the white marble headquarters of the Bank of Montreal might even struggle to make the list of the top five tallest buildings in the city. Here's a look at what the ranking of tallest buildings might look like come 2025. Developer Sam Mizrahi's titanic plan to build the tallest building in Canada at the corner of Yonge and Bloor was revealed earlier this year after wreckers began unceremoniously clearing the site. If built (and there's a long way to go yet) Foster + Partners would be responsible for pushing Toronto's highest rooftop above 300 metres for the first time. For comparison, "The One" would be roughly the same height as New York's Chrysler Building. Frank Gehry's landmark King West tower project has been endlessly reworked since it was first announced in 2012. Three towers have become two, and the exterior cladding has been transformed from soft and dreamlike to hard and crystalline. 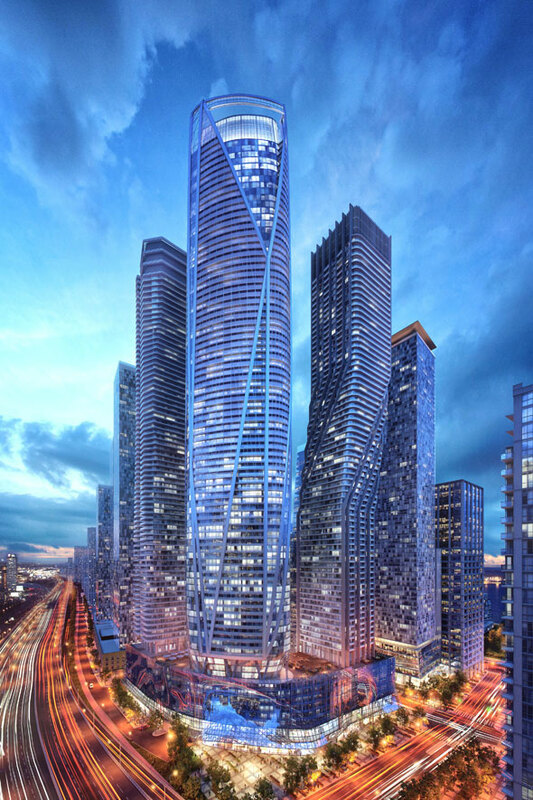 At 305 metres, the tallest of the two buildings promises to stand out among Toronto's increasingly crowded skyline and deliver the city another international landmark. Queens Quay East is set to undergo profound changes over the next five years. The just-announced Daniels Waterfront project, a mix of offices, creative studios, educational facilities, stores, and residential properties, combined with the ongoing construction of Aqualina, Corus Quay, Waterlink, and 1-7 Yonge St. will, it's hoped, turn the formerly bleak industrial zone into a desirable extension of downtown. 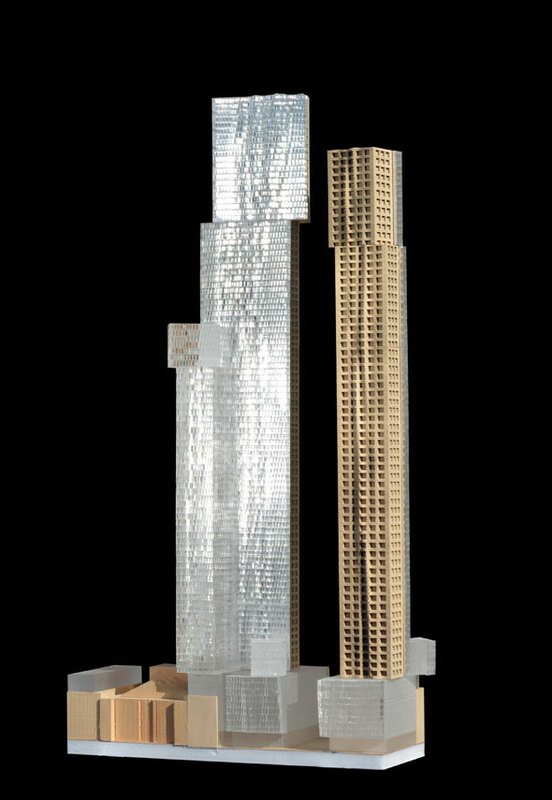 The tallest tower in the 1-7 Yonge St. project could hit 303 metres, but the necessary approvals still seem to be some way off. The Trump Tower (or perhaps Trum tower, as the rooftop sign read until recently) is technically the second tallest building in the city, taking in to account the corner spire that forms part of a colourful vertical art feature called Ligjhtline. The mixed-use building, which includes a hotel, condominiums, and stores, was ostensibly finished in 2012, but several features, including the aforementioned sign and art feature, weren't completed until 2014. That Scotia Plaza was built at all is impressive. The developers of the narrow burgundy office complex negotiated a controversial deal with the city that traded a reduction in size of separate development, a promise to build affordable housing, and a $2 million payment to an anti-poverty group for permission to build above the local height limit. 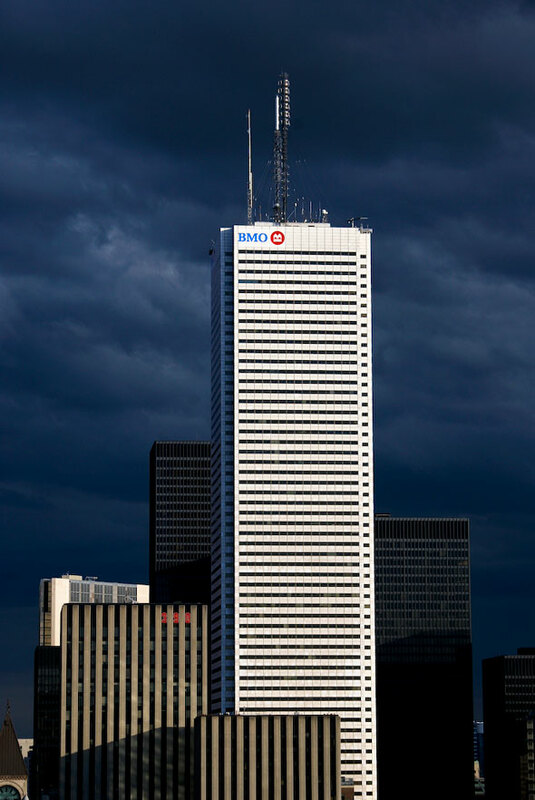 Rival bank TD hated the idea (partly because of its proximity to TD Centre) and waged a public PR war against the tower. Despite numerous gripes, Scotia Plaza opened as planned in 1988. Yonge and Gerrard's monster condo looks every one of its 273 metres thanks in part to its relatively isolated location away from the skyscrapers of downtown. Like the CN Tower, Aura's distinctive swooping roofline and oval-shaped central core pop into view from places as far away as Coxwell and Gerrard. 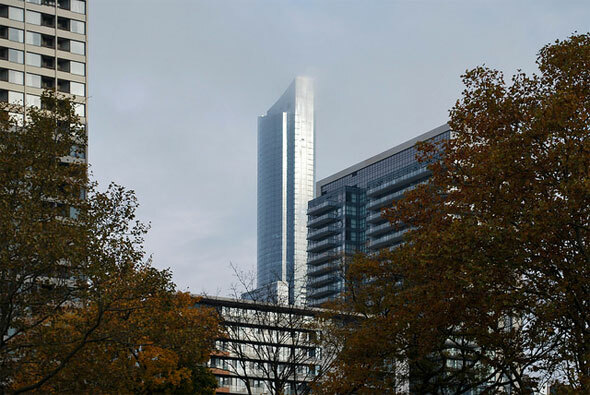 The most recently completed structure in the top ten and the tallest residence in the city, Aura officially leapfrogged Commerce Court West in mid-2014. Approved last year, developer Cadillac Fairview's strange planned tower at 160 Front St. looks like its clenching its teeth in pain, based on drawings showing the west and east elevations. 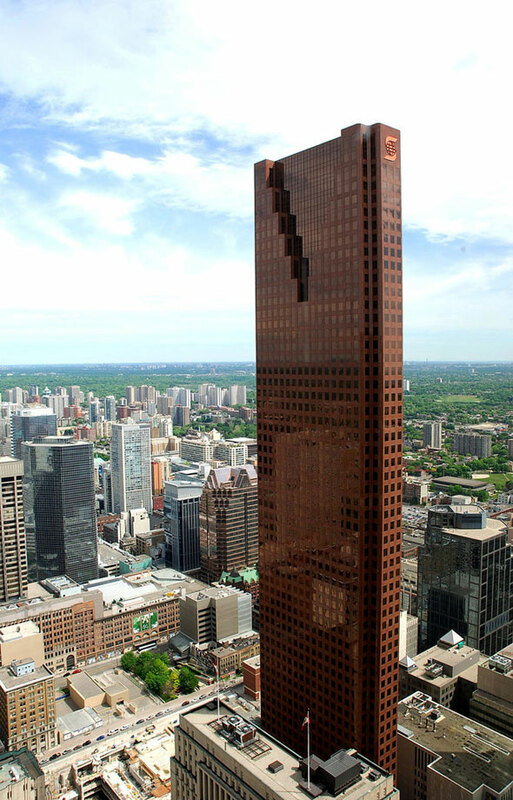 Hopefully, though, the finished piece, which appears to lack any sharp edges, will look a little happier at the foot of University Ave. At 265 metres, 160 Front St. won't quite trump Scotia Plaza, but it will leapfrog Commerce Court West. 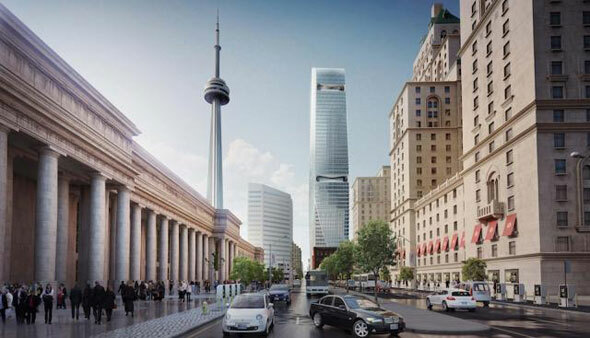 Announced earlier this year, the principal tower in the planned 8-acre, $2 billion Bay Street mega project is expected t break into the top ten if completed as planned. 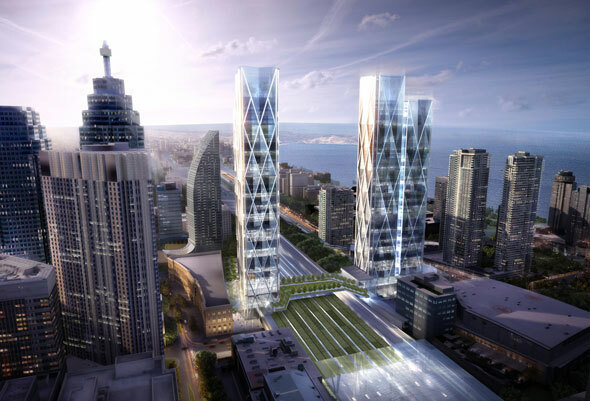 Also part of the proposal is a new GO bus terminal and "sky park" over the rail corridor, a potential first for Toronto. At 254 metres, 45 Bay would edge out Commerce Court West, one of Toronto's oldest modernist bank buildings, in terms of height. Rising a sheer 239 metres out of the Bay Street sidewalk, Commerce Court West, like its sibling to the northeast, was once the tallest building in Toronto. Completed in 1972, the tower used to have a public observation area on the 57th floor that afforded panoramic views of downtown. Inside, caged tropical birds chirped over the sound of soothing music. Entry was 50 cents. CIBC closed the observatory the same year the CN Tower opened, citing a lack of visitors. 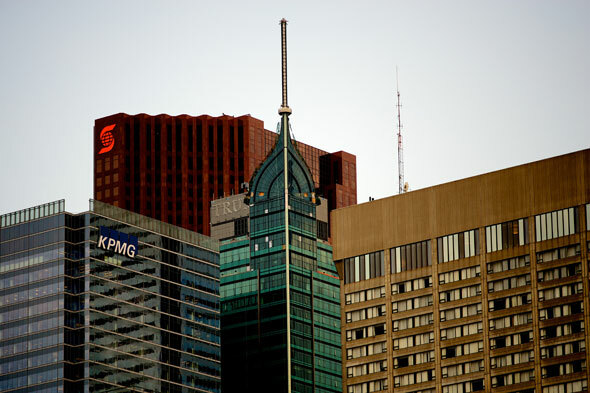 Note: An earlier version of this post incorrectly stated that Aura leapfrogged Scotia Plaza. It should have read Commerce Court West. Oops! Also, First Canadian Place is actually now clad in glass, not marble. The original white Carrera marble exterior was replaced over several years, starting in 2010. Images: David Sherret, Philip Johnson, Marcanadian, yoyoeq, Ian Muttoo/blogTO Flickr pool.